Here is a flier adver­tis­ing the next con­cert which will have my music on it — the World Pre­miere of Two Rilke Songs. (Click image for larger detail.) In fact, I am still fin­ish­ing the final draft of one of the two songs as this is being posted, so this will be a very fresh piece of music! 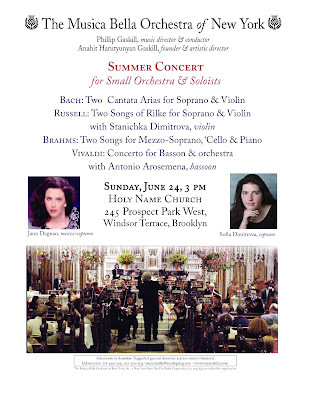 Many thanks to soprano Sofia Dim­itrova and her sis­ter, Stanichka, for their help in get­ting this piece written. By the way, this will be a Brook­lyn pre­miere for me; to my knowl­edge, I have not had my music per­formed in Brook­lyn. Hope to see you there!